Before answering, let me confide to you that I am a “happily ever after” kind of gal at heart. So the fact that I’ve written two novels against the backdrop of slavery in the 1800s may seem like a highly unusual choice. After all, what good can be gained by stirring old ghosts? For this reason, there is not a lot of adult fiction written about this period. I suspect this is because it is not a time we reminisce over. Instead we hide it from sight like an ugly scar. Readers and writers alike often avoid revisiting these pre-Civil War years because of the horror and shame it stirs in our moral conscience. In keeping the door closed on this period, we miss the chance to celebrate and marvel at the incredible acts of courage and daring challenges that were the genesis of social change in our country. The secret network known as the Underground Railroad is the perfect example of the best of America in the worst of America, and it serves as a vehicle of transformation for my main character, Jacy Lane. 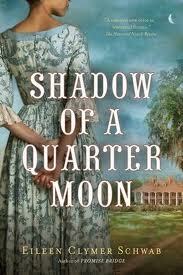 In my novel, SHADOW OF A QUARTER MOON, an unimaginable secret changes the course of Jacy’s life; not once, but twice. First, when it is hidden from her, and then when it is revealed. As the daughter of a plantation owner, Jacy has been raised in privilege until she discovers that she is the offspring of a dalliance between her father and a slave. Amid the shock and complexities of her mixed heritage, Jacy is simply a woman longing for love, happiness, and a sense of wholeness; however the 1800s are not a simple time and Jacy begins a treacherous journey of denial and self-discovery that is fraught with danger and life-altering choices. She soon discovers that what she chases is as elusive as the secret network she hopes can save them. From the author of Promise Bridge comes a powerful novel of the pre-Civil War era South and the Underground Railroad.